Hey there. I'm Faydra. Never Fay. Seriously--never. I'm a south Florida native and beach lover whose writing obsession started in 4th grade. After a "write three haiku" assignment, I figured surely the teacher meant three pages of haiku. I met my husband at the University of Florida. Go, Gators. We have three sons. The oldest was adopted from Russia and the middle was foster adopt, so if you wanna talk adoption I am here for that. We had our youngest, the uh, old-fashioned way. Really old-fashioned, you might say, since we did a home-birth. He has Fragile-X syndrome. I'm all about talking about that too. I like concerts and theme parks and big cities and small towns and trendy restaurants and mom 'n pop hole-in-the-walls and book events and museums and getting away from all those things to hike or kayak or paddle board. 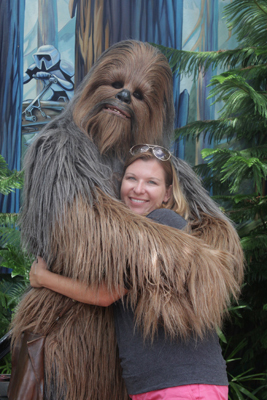 I did NOT pull a Rory Gilmore with that Chewie. On the average day I mom. I wife. I do churchy things and other volunteery things. And, more years since my MFA than I'd care to admit, I write books. The photos on this site are taken of the people and places I love. Please do not use any of the images without my written consent.